With proper oral care and routine visits to a dental office, natural teeth can be protected for a lifetime. Unfortunately, this may not be the case with all of us. Tooth decay, injury and periodontal disease are the common causes for tooth loss in the U.S. The loss of a tooth can lead to a number of problems with oral health. Dental restorations are aimed at addressing these oral health problems and restoring the lost functions. Dental implants are one of the most successful forms of restorations in dentistry because of their aesthetic and functional benefits. An implanted tooth can function as good as a natural tooth. Maintenance of oral hygiene and periodic visits to our Sonoma dental office are all that are required to ensure that the implants last a lifetime. If you or any of your family members are planning to restore lost teeth, make an appointment and visit our practice for a dental implant consultation. Our dentist makes sure to recommend the best restorative option for you. Owner, Dr. Kimberly Hubenette has over 20 years of experience in restorative dentistry and is a Master of the Academy of General Dentistry and a fellowship from ICOI. Our dentists make sure to recommend the best restorative options for you. Dental implants are artificial teeth roots which can be made of titanium or zirconium. The restoration is surgically inserted in the jawbone. It is considered to be one of the finest solutions to tooth loss because it addresses almost all problems that arise from the condition. So what really happens when you lose a tooth? A dental implant can become an integral part of the supporting bone structure. This gives the implanted tooth higher stability and strength. The chewing efficiency of implanted tooth is known to be 100%. By filling the gap, the restoration prevents nearby teeth from changing positions. The supporting bone is protected and the patient regains the confidence to smile. Dental Implants – The Restoration Process Who can Get Dental Implants? Any person with a healthy jawbone can undergo dental implant surgery. Our dentist performs comprehensive examination of oral health during the first visit. Problems like periodontal infection must be taken care of in the first place. We also make a note of patient’s medical history. Uncontrolled diabetes and radiation therapy in the head and neck region are a few things that raise concerns. As a part of the patient’s oral health assessment before recommending dental implant surgery, our dentist sends the patient for Serum CTX test. This is a test performed to check the likeliness of Osteonecrosis of the Jaw (ONJ) which is induced by bisphosphonate. It is a fasting blood test and the result assesses the risk level. This is a disease characterized by improper wound healing following an oral surgery, periodontal surgery or root canal treatment. The test to assess the risk of BONJ before recommending dental implant surgery is vital because the success of the surgery depends on how well the jaw bone heals and bonds with the implant restoration. Patients with a history of use of bisphosphonate are known to be at higher risk of BONJ. On confirmation that the jawbone is healthy and sufficient to perform surgery a treatment plan is set where the position of the implant is mapped. How is a Dental Implant Inserted? Dental implant surgery is performed in the presence of local anesthesia. An incision is made in the gums and our dentist starts off by creating a bony recess in the planned position. A series of drills are used for this purpose. The implant is torqued into the position and a cap is fixed over it. The gums are sutured back and the site is left to heal. Our team guides patients on how to care for the implant and surgical site during the healing period. The restoration of a lost tooth is done once the implant is healed. 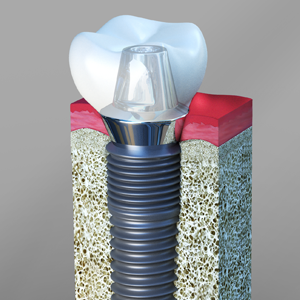 Osseointegration is a process where the implant forms a functional bond with the bone tissues. Once this is complete, we take impressions of teeth and fabricate a crown. The implant cap is removed and an abutment is fixed over it. Finally the crown is cemented over the implant to complete the restoration process. Our team explains to our patients how to maintain oral hygiene when living with the implanted teeth.